Years ago I was giving a presentation and talked about how I used toy trains in therapy to address a number of therapeutic goals with children on the autism spectrum. I talked about how valuable the trains were in developing social skills, vocabulary, spatial concepts, number concepts, flexibility, and a number of other core skills. About a month later, a colleague of mine was attending an IEP meeting at a school and the school speech therapist indicated she had attended my presentation. She went on to tell my colleague (also a speech therapist) that she had bought a train set and yet, the child she was working with had not significantly changed. I don’t know how she could have misunderstood what I was saying in the workshop: it’s not the train that makes the difference, it’s how you use the train in therapy! If you’re not a good therapist, and you can’t connect with your client, there is no train or any other tool that is going to make your therapy work. It is so very frustrating to me that there are people who will read about “Lego Therapy” and think that it’s the Lego’s that are making the difference. You may recall a previous blog in which I discussed ‘process’ versus ‘content.’ If you don’t know how to deal with the process then the content becomes irrelevant. It doesn’t matter if it’s a train set or Legos, as the content, or the toy, is not the salient feature of the interaction. Using a particular toy to achieve a goal is based upon having strategies and techniques for developing a skill. Most kids on the spectrum are fairly rigid in their way of dealing with the world and the people in it. They have their ways, their routines, and their style, which often does not allow for change or dealing with the unexpected. So, let’s use the goal of increasing flexibility as an example. Depending upon the age of the child (or person), I want to find ways that they can personally experience the value of flexibility. So with a train set, or toy cars, you can have a child drive the trains/cars on different tracks or get off on different roads and be rewarded for going a different way. With older children, adolescents and even adults, I have used a rubber band to teach the concept of flexibility. First, I explain the concept of flexibility and rigidity in concrete ways with real world objects. I find items that are rigid (e.g., a pen, a key, a phone, anything that’s in the immediate environment) and I show how they do not bend. They do not change. Then, I take a rubber band and I demonstrate how it is flexible, changeable. I show how the rubber changes shapes and how it can change according to the context. For example, if I put the rubber band around a square box of tissue the rubber band becomes square, but if I put it around the leg of a chair, the rubber band becomes round. After the concept is well understood, we use examples from the person’s life to talk about how they are being rigid or flexible. 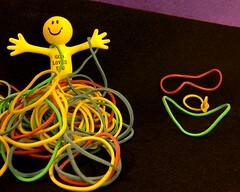 The rubber band can then be a useful reminder for how to work at being more flexible in certain situations. Currently there is a trend for wearing the colored rubber band bracelets making it even more ‘cool’ to have a rubber band.